The M62 was yet again the venue for severe traffic congestion on Friday after a pile up involving lorries and cars, in which one person was killed. Concentrated orange juice and oil spilled from a lorry, forming a bizarre slick across the carriageway, already strewn with wrecked vehicles. The accident took place on the stretch between the M66 and Oldham. Traffic came to a halt, and there were back-ups right the way into Yorkshire to the east, and along the motorway toward the M61 interchange to the west. Police routed traffic off the motorway, causing surrounding roads to be jammed for miles around. The M62 has gained the reputation for being one of Britain's nastiest motorways. A police officer reported that over 115,000 vehicles per hour were passing the Oldham/Rochdale interchange. The volume of traffic is twice that originally planned in the 1960's. Plans to widen the motorway to eight lanes, as well as a second trans-Pennine motorway, have been abandoned. But no matter how much people criticise roads, where would be be without them? There was drama at another motorway near Manchester when a 22 year old woman attempted to jump off a motorway bridge near Northenden. A passing lorry driver saw the woman, doubled back and helped prevent her from harming herself. Police searching for the killers of the Longsight girl gunned down last week say the public still appear to be showing reluctance to come forward and name the gunmen. A police officer speaking on GMR radio said the girl was certainly not the intended target. There are groups of youths, he said, intent on harming one another. Rumours that the feuding was related to "taxi wars" were false, he said. Hill House, the 17th century half-timbered mansion in the path of the second Runway, was in the news during the week. It appears the Airport are going to place the house, and neighbouring Hanson House, both now dismantled, on the market. This goes against their original assurance that the houses would be relocated in the area, said veteran Anti-R2 campaigner Jeff Gazzard, who's planning to retire from campaigning this year. So if you fancy buying up a desirable piece of Cheshire real estate and having it shipped out Queensland or the Yukon, you can enquire here, though personally, I think they should stay in the area. Manchester City Council's rates will be going up "only" 10% this year, it was stated. The rise was kept lower than expected by making cuts in certain areas, but also through increased revenues, as a result of the favourable economic climate. I pay over £600 a year to Manchester Town Hall in Council Tax, considerably more than what I'd pay for an equivalent property in other parts of the region. One of the cuts the Council wants to make is their Ghyll Head Activity Centre, in the Lake District. They intend to replace the centre with a locally-based one in Debdale Park. But critics say that it's much better for Mancunian kids to have a complete change of environment. I can certainly agree with that. Otherwise we'd all be going for our holidays to Phillip's Park or Boggart Hole Clough, instead of Cornwall or Torremolinos. As Richard Branson prepares for his next ballooning adventure, the users of Virgin Trains continue to put up with a sub standard service. A report out last week revealed that service levels on most of the independent railway operators had deteriorated since they took over. Virgin Trains was singled out for criticism. Branson originally described the task of modernising the long-neglected rail system as "Mission Impossible", used as a name for one of his locomotives, but many passengers are of the opinion he should come down out of his balloon, come up to Manchester and sort out the mess. Well, one of his balloons was being tested in a building on Merseyside, so perhaps he's getting the message. The weather has been changeable and not very wintery all week. There was rain on Tuesday, but on Wednesday it was cold and clear, with deep blue skies over Manchester at sunset. On Thursday it was sunny in the morning, but overcast later. Friday was a mixture of sunshine and clouds. Temperatures have been on the mild side, and yesterday was grey, drizzly, and overcast. Today is a little brighter, and temperatures have dipped, with snow over some parts of the UK. On Friday I attended the funeral of Andy Blunt, who with Nigel Stewart, formed one half of XTML, pioneers of the original Virtual Manchester. Andy died over Christmas at a tragically young age. He was known among friends for kind nature and wacky sense of humour. As Nigel Stewart commented, it's a shame that, now that things are starting to take off in a big way, Andy won't be there to enjoy the fruits of his hard work. Butch and Sundance, the Ginger Tamworth pigs that escaped the slaughter house in Malmesbury, Wiltshire, became the subject of world media attention. Irish republican leaders Gerry Adams and Martin McGuinness voice their disapproval of the peace proposals, saying the Government was capitulating to the Unionists. Last week Unionists voiced their dissapproval of the peace proposals, saying the Goverment was caputulating to the Nationalists. Tension in the Middle East rises on the anniversary of the Gulf War, as Saddam Hussein continues to confront the UN. 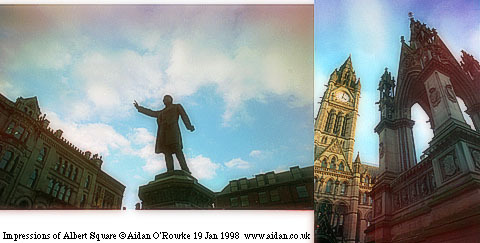 Have a look at Manchesternet for more Manchester info, the BBC for today's UK and world news. For a complete contrast from Manchester, see my Arabian Collection of photographs. Last week's pub was the City Road Inn, as recommended by Steve Moran in Hong Kong, but moving to Australia. This week's pub is in Hulme, on Royce Road to be exact. It has a strongly Caribbean feel, with jam nights and lots of other live music. Friends and colleagues of the late Andy Blunt met there after the cremation on Friday. Do you know the name of this pub? Thanks very much for the Flashback to 15 August 1948. As the 40th anniversary of the Munich air disaster nears, 6 February 1958, I am sure that a Flashback to the news of that event would be very emotional to many of your readers. As an ex-mancunian now living in the U.S.A. I would like to see October 8 1940 featured as a Flashback if possible, thanx. I heard something this week that took my fancy.You may know that the phrase 'fair dinkum' is about as Aussie as one can get, well apparently the term originated in Lancashire and meant 'a fair days work'. It would be interesting to find it's Regards Stan. derivation.I wonder if any of your readers could throw any light on it ? EYEWITNESS IN MANCHESTER IS ONE YEAR OLD THIS WEEK!